How Advanced was Ancient Knowledge of Genetics? 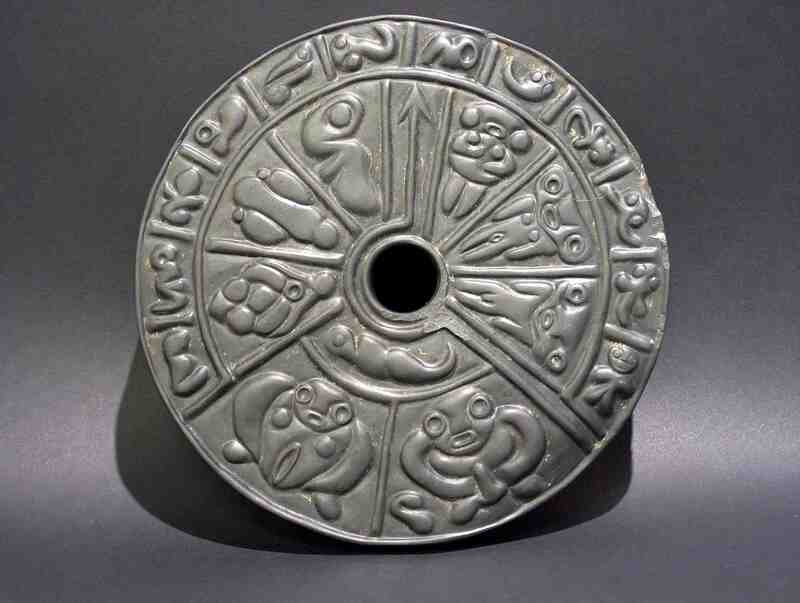 The Genetic Disc is dated Pre Columbian and is amazing in several ways. Archeologically it challenges our excepted historical knowledge. Scientifically it challenges our understanding of the formability of materials. And in terms of Biology it’s content pre dates any of our known imagery of the same subject. Archeology seams to have a well known category. The one we can follow closely in school books and modern history books. However there is another category of archeology, one not very known to the mainstream public. It is not my intention to weave any conspiracy. However it is a fact, once you research the matter for your self, that many great archeological discoveries made over the past decades have never been exposed to the greater public in peer reviewed magazines and hardly threw the media either. This field of disputed archaeology is also coined Forbidden Archaeology and the artifacts it deals with are known as “out of place artifacts“. The point is, that we are constantly re discovering our selves, our origin and history. With origin I do not mean the Ancient Alien theory. In this regard I ask of you to please read without any prejudice. I believe we underestimate our ancients and the pre historic civilizations that mite have existed before ours. One of such out of place artifacts is the Genetic Disc. Much credit goes to Mr. Klaus Dona who sponsored the Image of the Disc. He has spent more time in the field than many academically acclaimed Archaeologist. He dedicates his days, aside from his main work as a art curator, to uncovering and researching many other such artifacts. Many of which, by carbon-dating, pre-date the formally excepted beginning of human civilization with writing, art and handcraft. The Genetic Disc was found in Columbia and the original belongs to a well known designer and architect there, Jaime Gutierrez. He has been collecting strange artifacts from his country for decades. The Genetic Disc is made of a very peculiar material called lydite. It measures a diameter of about 27cm (10.63 inches ) Hardly anyone will know this material if he is not an expert on materials. It’s so unknown, the spelling checker of most text editors including My Blog’s doesn’t have the word lydite in it. This material is very hard, almost as hard as Granite. Which roughly compared to Diamond on a MOHS scale would be between 6-7. However lydite is very fragile due to the fact that it’s internally layered like paper. So making anything usable from it would be sheer impossible, according to our modern day technological standards. It would break away with the first impact or- try to carve something in to it. However the picture of the Genetic Disc you see above clearly shows, not only a well bound solid, but also a ornamented- with little symbols or pictures- rounded flat disc. How were the ancients capable producing such a art peace? Another interesting aspect about the Genetic Disk are the pictures on it. In terms of Biology, many of the little pictures on it are only known to us today do to the use of microscopes. Yes, that’s right. We are talking about a object which is probably centuries or even thousands of years old. It shows pictures of a sperm, fetus and even female egg. With as little as school biology, you would have to put in some mental effort to ignore the associations that spontaneously pop up in your mind, when observing the pictures. It is mysterious how such ancient man could know something, which is technologically very profound to us. This brings us to one of the most pushing aspects of the Genetic Disc- It’s age and the question, who and how did they create it. Again I would like to emphasize that we still know much to little about the capabilities of our ancients or even their technological standards. You are free to draw your personal conclusions about the Genetic Disc, from the facts I have presented here. Many still draw their conclusions based on the main stream of science’s opinion or the peer reviewed magazines they publish. The information presented here mite be disputed in such sources. But it does not make it less credible. As mentioned in the beginning the existence of the Genetic Disc – which is literally a un copyable master peace, even with todays technology-is still a mystery. Regardless of any of the above we as a rational and universally open being are once more challenged to disregard what we think to know about our selves and history and be more open to what we can still learn, remember and readapt.